We’ve all been there at one time or another; walking towards a door with your hands full of grocery bags before it closes behind the person who just went through, having someone bump into you in a supermarket, or having the barista ignore your “thank you” after he slams down a cappuccino in front of you. 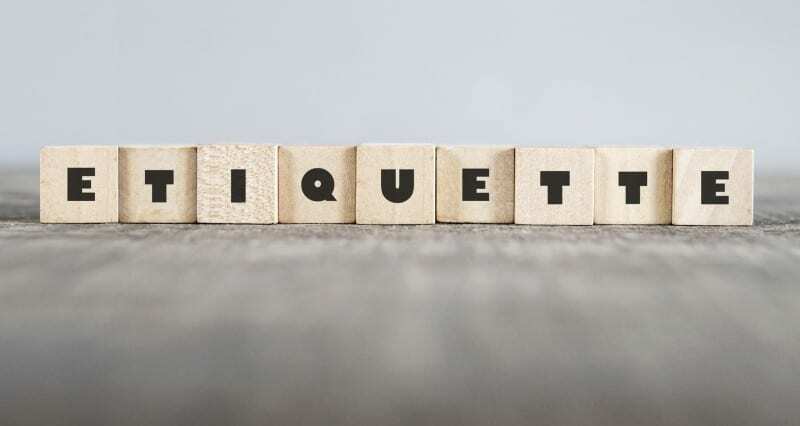 The thing about manners is that it doesn’t take a lot of effort to be “good” but it’s super easy to be “bad”. With any luck, we learn this from an early age. There are a number of different theories as to where it started, from bartenders who used to shout it during fights to tell people to watch their pints and quarts, to telling children to avoid mixing up the letters P and Q when they’re learning to write, or that it comes from typesetters mixing up the letters. Long story short, it’s just a way to tell someone to remember to say “please and thank you” when necessary. Even when it’s not necessary, it takes zero effort and can make a huge difference in how you appear, and it’s also a great way to come out of an argument or difficult situation. This is perhaps a bit of a generalization, but English cultures are used to taking turns when speaking. There are obviously exceptions, but it’s typically frowned upon and seen as extremely rude. There’s no reason to think that a single person’s view or opinion is worth more than another’s and it’s amazing what can be learned by simply listening to someone else. This is one of the first things that many people learn, both in childhood or when studying a new language. Some cultures are more forgiving than others, and it’s evident on the streets, on TV, or even in the office. Regardless, it easily makes for colourful, shocking, or downright offensive situations. The truth is, swear words (also known as: curse words, cuss words, expletives, four-letter word, dirty word, obscenity, blasphemy, the list goes on…), especially in a business context, should best be avoided. The English language is estimated to have between 250,000 and 1 million words (including the bad ones); surly there’s a cleaner way to express your idea. Keep the potty mouth and sailor talk out of the workplace and save it for the pub. Full stop and end of discussion. This is a tricky one, in particular when we start learning a language. It’s fun when you can start to recognize words or parts of a conversation when you’re in train or at a café. Sure, it’s fun to listen in on other people’s conversations, but how would you feel if someone else did that to you? Give people space if possible, and if you can’t, try to tune them out. A polite way to summarize this would be “There’s some stuff you just don’t need to know.”, but the truth is that it’s really just about “Minding your own business”. Sometimes, in the heat of the moment, we say things that we don’t mean, and immediately regret them. Whether in a business meeting, on the phone with a client, or having lunch with your colleagues, it’s never a bad idea to pause for just a moment and really think about whether what you’re about to say is exactly what you mean. It’s one thing to say “be polite” but it’s another thing entirely to actually follow through on it and put it in to practice. It’s more than just holding doors, saying “sorry”, and waiting your turn. It’s about treating others as you would like to be treated, and it’s as much about language as it is about behaviour itself. Smile. Give your seat to someone who needs it. Say hello to people you don’t know. It’s not going to hurt anyone, and it just might make the world a bit more pleasant. Shaune Peebles is a Canadian English teacher (and world traveller), with over 10 years' experience across Asia and Europe. Shaune discovered his teaching vocation in Guangzhou, where he worked for more than two years at Guangdong University of Foreign Studies (GDUFS) and at the Wall Street Institute (among others), before moving to Italy with his wife in 2009. A long-time language trainer in Milan, he completed a certification in Curriculum Development Instructional Design from Mt. Royal University in 2016, and is currently working as a Customer Success Manager for Docebo.